"He's the Biff to my Marty, the Leno to my Conan, the Parents to my Just Don't Understand"
As if writer Paul Cornell's 'Have Lex Luthor throw-down against every big villain in the DCU' story arc wasn't high-class enough, DC throws a Jimmy Olsen back-up into Action Comics #893 that puts many other full-sized comics to shame. 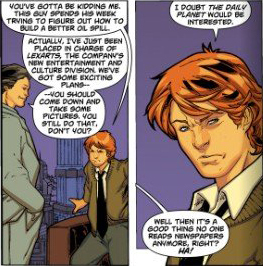 Yeah that's right - Jimmy - Olsen. 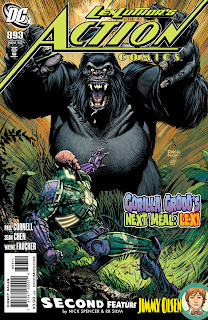 First up, the main feature stars Lex and Gorilla Grodd in an almost Spy vs Spy series of gotcha's, with each trying to prove who is the smartest primate of all. As robots and warrior gorillas collide, you won't believe what ends each go to in order to get the upper-hand. Writer Paul Cornell's trademark humour isn't lost amongst all the escalation either. 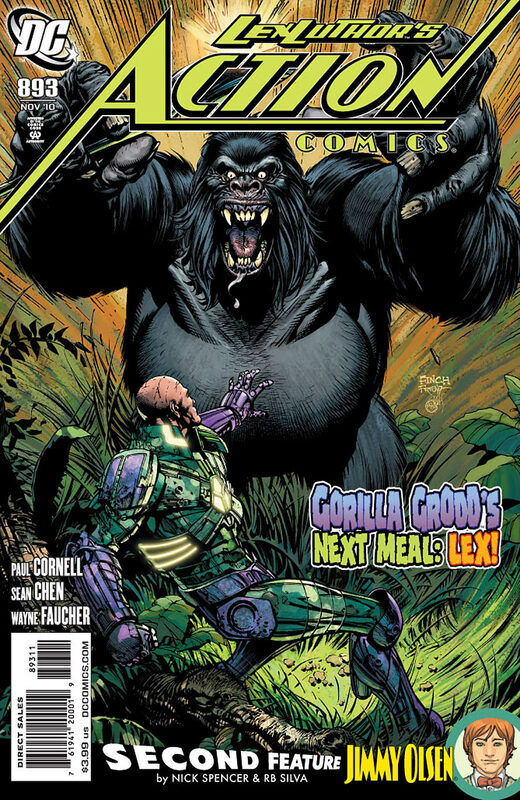 From Lex advising his robot Lois Lane he loves the way she uses Grodd's voice to say 'Your Master', to decapitation with a "combat spoon", to said Lois pointing out to Grodd he hasn't quite been successful in biting her metallic head off - this is the stuff of comic book gold. 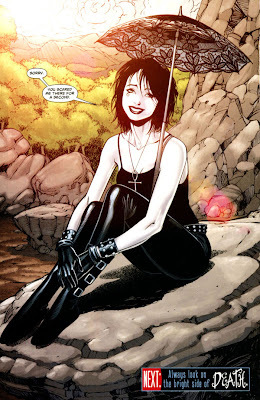 And that's even before Neil Gaiman's fan favourite not-so grim reaper shows up on the very last page! Moving onto the Jimmy Olsen back-up strip, writer Nick Spencer registers on the 'next-big-thing-o'meter' by weaving together just the right amount of imagination and reality, so that you finish the peice wishing Superman's Pal Jimmy Olsen was ready for a return to a newsstand near you. From outwitting an attention deprived genie scientist "with a giant underground technobottle" to taking the blows from girlfriend Chloe Sullivan of Smallville fame, this is the best Jimmy has read since All-Star Superman. The dialouge is sharp, witty and matches the crisp expressive linework of artist RB Silva perfectly. Rounding out the picture we meet Olsen's arch rival - Sebastien Mallory - the smuggest yuppie ever to step foot on the Luthor corporate ladder. 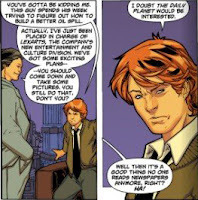 The fiery journalist girlfriend, the Luthor employed nemesis and the crazy adventures almost complete setting Jimmy up as a younger Clark Kent, but with his own personality clearly defined Jimmy still shines through. Ah, I do love Lex, one of my favourite villains, and way ahead of any other in terms of cool actors who have played him. Love stories of him outsmarting people, I particularly remember the issue from the nineties when he married the contessa and outsmarted Supes and the law. Nice to see him back in purple and green. Aaron - I love the fact Lex is back in the green and purple too. The fact he took Superman on without it was always a head scratcher to me.